It could be a nice quiz question: What do you know about South-Korean pop music? Chances are, your knowledge won’t stretch beyond Psy’s ‘Gangnam Style’. That the country has had an adult music scene besides socalled ‘K-pop’, was recently evident at the Closing Ceremony of the Olympic Winter Games: The thirteen year old guitar-virtuoso Yan Tae-hwan performed his interpretation of Vivaldi, and the band Jambinai- an icon of the Korean indie scene- made the stadium shudder with its hit ‘Time of Extinction’. Eager to know more? Visit the ‘Modern Sound Korea’ music festival in Amsterdam on 29 April. The festival is part of Modern Sound Korea Brussels, which will have its fourth edition in Belgium this year. During the festival, the emphasis is on innovative and stylish artists from several Korean scenes, from underground to modern or experimental classical Korean music (gugak). 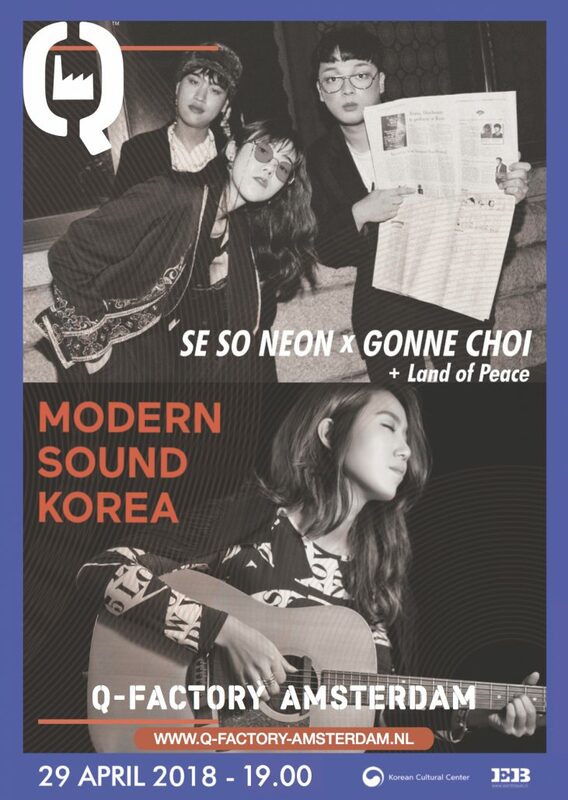 During the first Dutch edition, three acts will be featured: The Korean response to Oasis, Land of Peace, singer /guitarist Gonne Choi, and the trio Se So Neon as a headliner. Imagine yourself on a tropical beach, you feel the warm sea breeze through your hair and friendly sun rays on your skin. That peaceful feeling is what Land of Peace is trying to communicate. Influenced by British rock from the nineties, they use unconstrained sounds, interesting guitar compositions with straightforward melodies that emphasise their freshness and originality. When listening to the music of Gonne Choi, it sounds as though you are transported to a place that cannot be located on a map – you can only find it in your heart. Her songs have a unique colour and atmosphere, which is related to the broad musical experiences from her youth. Not only did she master the gayageum, a traditional Korean instrument, and the classical singing tradition pansori, she was also the singer of the hard rock band at her university. That wide musical outlook makes it easy for her to play with the boundaries of genres like rock, folk, jazz and classical. This is evident on her EPs and albums too.